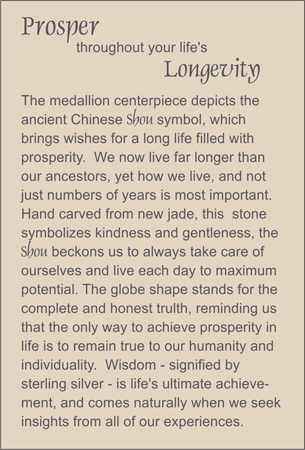 MEDALLION: Celadon color new jade hand carved medallion depicting the ancient Chinese Shou for long life and prosperity. ACCENTS: Sterling silver barrel with open work and depicting birds in tree branches, and faceted rock quartz crystal globe. COMMENTS: One of the very first TRULYHUMANmedallions Barbara ever designed - this is a truly timeless favorite.